Prospect Park’s Celebrate Brooklyn series is back for the summer, kicking off with an eclectic hip-hop lineup headlined by Community star Donald Glover’s rapping alter ego Childish Gambino. Even more exciting (at least for us), is the addition of gap-toothed Detroit rapper Danny Brown and Los Angeles’s Schoolboy Q, whose Habits & Contradictions is one of our favorite records of the year. Tuesday June 26 at 6 p.m. Prospect Park Bandshell, Prospect Park West (between 10th and 11th streets); Brooklyn. Experiencing Japandroids live is a lot like reliving every epic party from your teenage years, jammed into one hour-long, ecstatic set of set of blistering rock ‘n roll. Each beer, break up, high five, and mosh pit gets its due, filtered through the older, wiser lense of the Canadian duo. Wednesday, June 27, 9 p.m. Bowery Ballroom, 6 Delancey Street (between Bowery and Chrystie); 212-533-2111. Together Indra Dunis and Aaron Coyes record under the name Peaking Lights, a project that takes the best of dub, psych rock, and pop and mixes it together in a blender of sunny sounds and good vibes. Their release for their great new album Lucifer will be held this TGIF. Friday, June 29, 70 North 6th Street (between Wythe and Kent Avenues); Brooklyn. 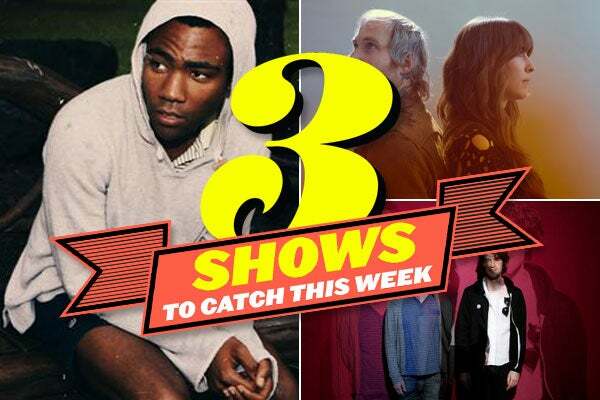 Childish Gambino and Danny Brown also play Central Park Summerstage. June 25. Veronica Falls play a FREE show at South Street Seaport. June 29. Codeine play The Bell House. June 29.